Hi Dolls :) Happy Halloween I hope you are all having a wondefully sweet day! 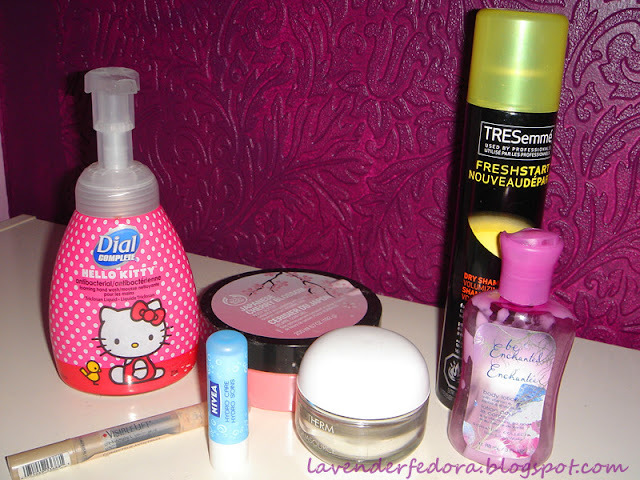 It's the beginning of a new month again which means it's time for another monthly empties post. I used up another 2 containers of body lotions. I know, I'm a bit lotion crazy :P First of all, I used up The Body Shop Japanese cherry blossom body butter. I really like the packaging, Isn't it super cute? As for the scent, I think it smells pretty good, but nothing extraordinary. It's pretty moisturzing but I don't really like the consistency. It's a bit hard to spread on your body. And since I like to give my body a small massage whenever I put on lotion, this isn't the best choice. So overall, I enjoyed using it but I wouldn't repurchase this. Since we're on the subject of body lotion, I used up this travel size bath and body works Be enchanted body lotion. Again, the packaging really sucked me in. And I have to say,when I first smelled this, I fell in love with the scent immediately. It's extremely sweet and candy like. But as I started to use it daily, it almost gave me a bit of headache. So of course, I was really happy that I finally used it up but it didn't take me that long anyways because it's so tiny. And nope, I would not repurchase this. Oh no, I used up a concealer. I absolutely loved this and I used it pretty much every day under my eye when I wear makeup. This is the Loreal Visible Lift undereye concealer.The whole thing is so well-loved that the words are pretty much rubbed off on the packaging. As I said, it's an amazing concealer. It covers undereye darness like a dream.I got it when it was on a crazy sale. It was reduced from $10 to $2. Now I think aboou it, it makes prefect sense cuz Loreal discontinued this product. I remembered reading a review on this product on Beautypedia and they gave this a super high rating. I'm so sad, I loved this concealer so much. Sigh, why do they always have to discontinue the better products. go out and grab another one. halfway through it. This is just terrible. If you are on the market for a new dry shampoo, please do not get this one. this month? Please share it with us.